Whether you are looking for gentle tree-lined green runs, cruising blues and reds, or steep black runs, challenging free-ride and off-piste skiing, Le Grand Bornand has something for every level of skier. 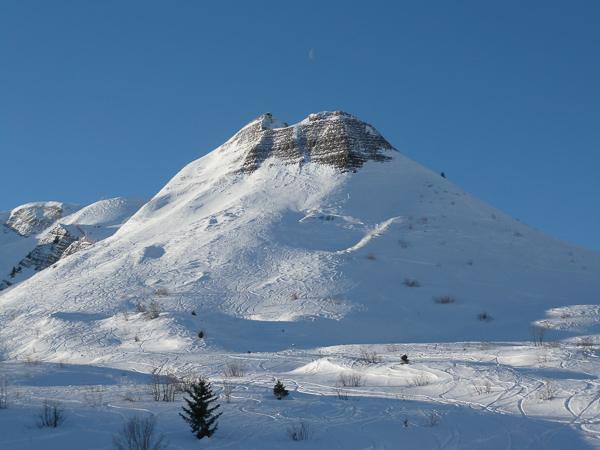 The 90km of pisted skiing in Le Grand Bornand is well-connected, compact and easily navigable, with the majority of the pistes found between 1500m and 2050m of altitude. However, you can also ski at village level at 1000m, which then gives you a total maximum vertical drop of 1100m. If that’s not enough, when combined with neighbouring resort La Clusaz, the full region offers 220km of pistes, covered by the Aravis lift pass – included with all of our holidays in this region. Le Grand Bornand has invested heavily in snow-making technology – it boasts 233 snow machines – which ensures reliable skiing from mid-December through to mid-April. 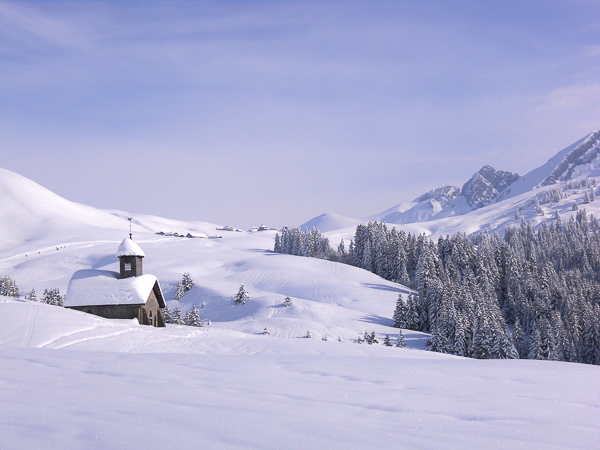 Despite its lower altitude, the Aravis region has a dependable snow record. The terrain accommodates just about everyone, from first-timers up to free-riders and freestyle skiers, while the ‘Famille Plus’ label underlines a continuing commitment to family skiers. The snow-park is rated as one of the best in France, with a boardercross, 4 jump lines and an airbag. Le Grand Bornand is a perfect resort for beginners and first timers with a superb ‘debutant’ area, as well as a great choice of slopes to learn and progress on through your holiday. Whether you are new to skiing or are looking to develop your skills further, our own private group lessons can help you towards achieving your goals. The nursery slopes of the highly accessible Rosay plateau have been completely re-developed for the 2017-2018 season. This including a 200m covered ‘Magic Carpet’ – L’Alpage Express – which is the longest in Europe. 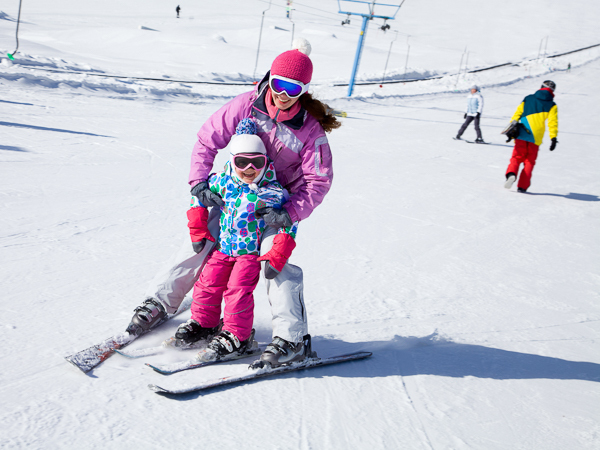 Its a great resource and helps enormously for your first time on skis. The long tree-lined green runs dropping down in to Chinaillon, along with the beginners’ area at the top of the Joyère lift, offer up plenty of variety once your confidence takes you beyond the nursery slopes, and you are ready to explore the mountain in a safe environment. As your confidence increases, the wide sweeping blue runs across the resort will get you exploring the terrain, enabling you to access the traditional mountain restaurants for a well-earned vin chaud, before taking on the challenge of a red run or two. So if you dream of filling your days cruising around fabulously groomed blue and red pistes in a beautiful, traditional setting on an easy to navigate mountain, Le Grand Bornand is the resort for you. From the tree-lined runs dropping down in to Chinaillon, to the more exposed north facing slopes of the Maroly valley, there are plenty of runs to motivate and excite you during your short ski break. The piste map doesn’t do justice to the terrain available for the advanced skier – from the free ride area at the back of Mont Lachat de Châtillon, to the remoteness of the off-piste at the far end of the Maroly valley and the steeps back down in to Les Lanches, whilst not extensive, will challenge the most accomplished skiers. The snow-park is considered to be one of the top five snow-parks in the French Alps, so if big air and rails are your thing, Le Grand Bornand will be a revelation to you! 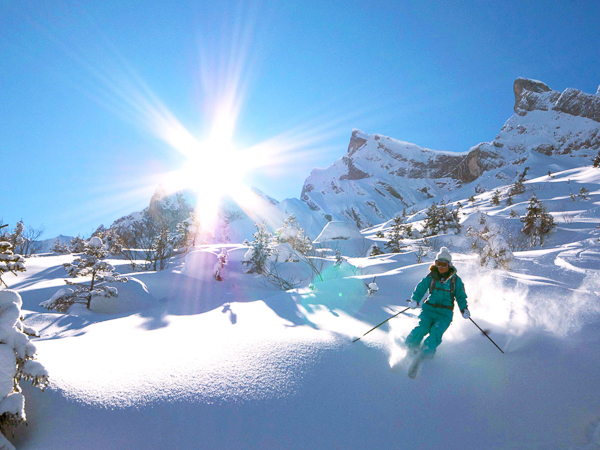 With its dependable snow record, 1100m of vertical drop, accessible off-piste and world class snow-park, Le Grand Bornand has plenty of options to exercise the best of skiers.